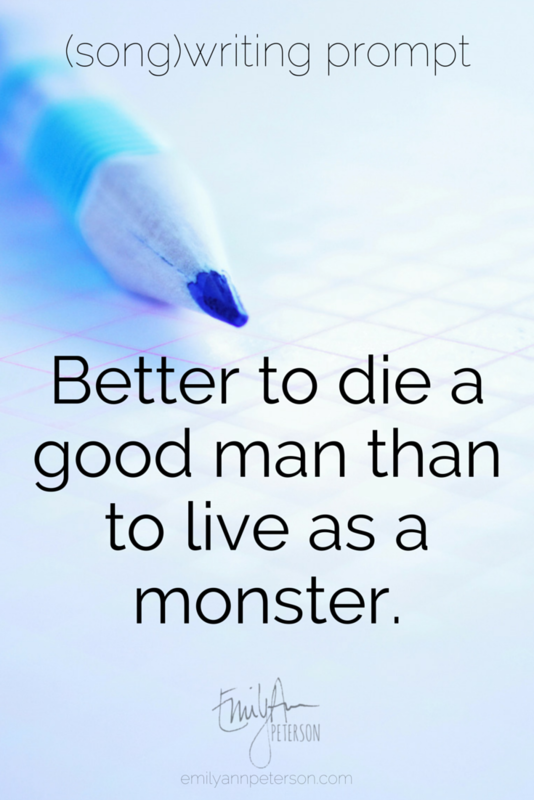 Prompt: Better to die a good man than to live as a monster. Better to die a good man than to live as a monster. Further Prompt Challenge: What does the death of a good man mean? How does that happen? Is it violent? peaceful? How does a monster live? How long does a monster live? What does the monster do with his life? Check out what the Reddit community came up with! Prompt: You are born into a world where love doesn't exist. You are born into a world where love doesn't exist. At the age of 16 you meet someone & become the first person ever to experience this emotion. Prompt: The quote "You don't really die until people stop talking about you" is true. 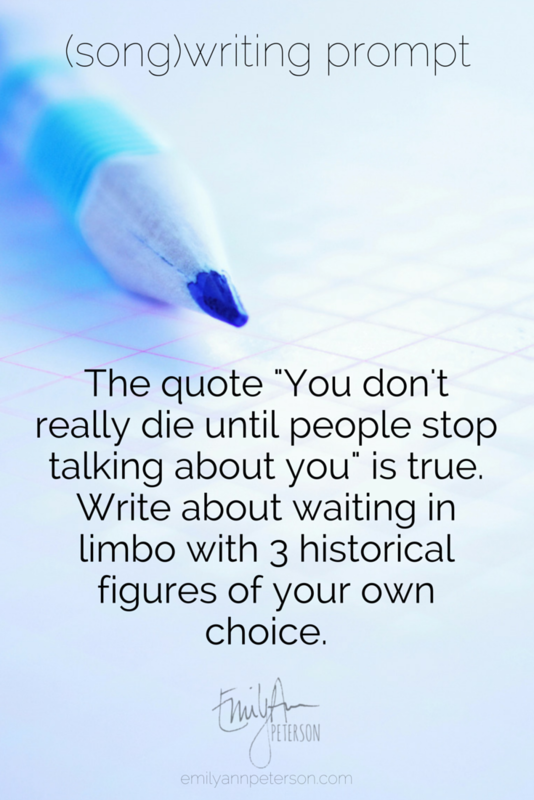 Write about waiting in limbo with 3 historical figures of your own choice. " The quote "You don't really die until people stop talking about you" is true. Write about waiting in limbo with 3 historical figures of your own choice. Prompt: "When someone has their heart broken, it actually breaks. You are a heart surgeon. Describe your most difficult case." When someone has their heart broken, it actually breaks. 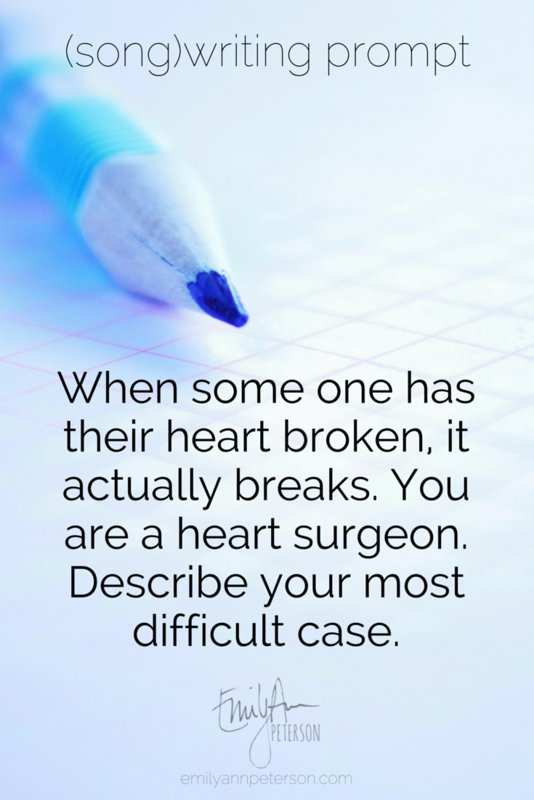 You are a heart surgeon. Describe your most difficult case. Prompt: You've suddenly gained the ability to see another dimension of colors. 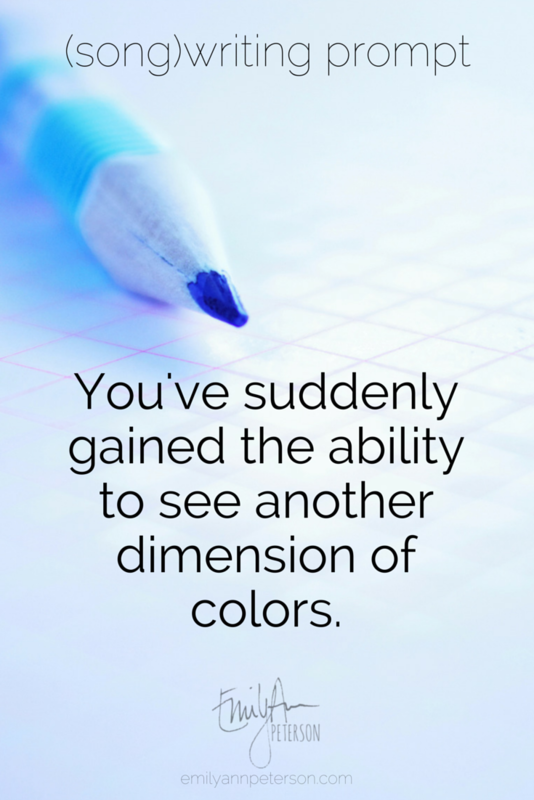 You've suddenly gained the ability to see another dimension of colors. Further Prompt Challenge: Imagine taking a pill that gives you the ability to see an entirely new dimension of colors. 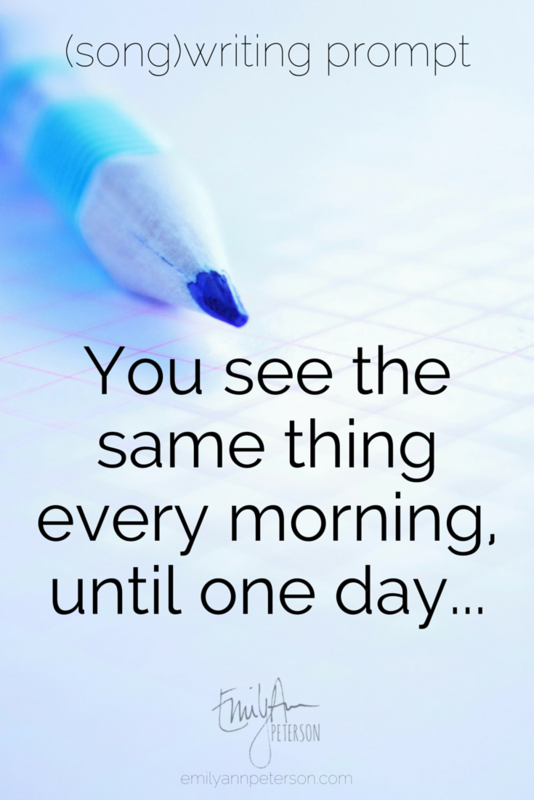 How would you describe what you see? Which words would you use? What new activities would you do with this new ability? What daily activities would feel new? 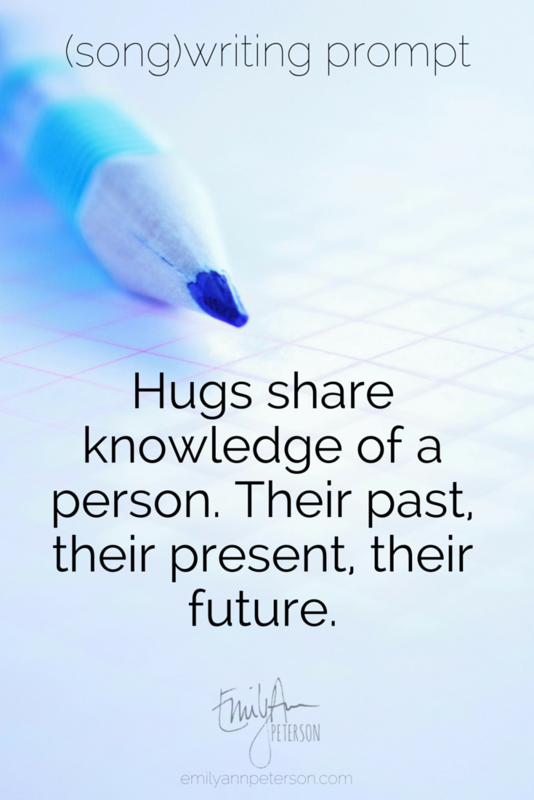 Prompt: Hugs share knowledge of a person. Their past, their present, their future. Hugs share knowledge of a person. Their past, their present, their future. Prompt: Write Using Only Song Titles. 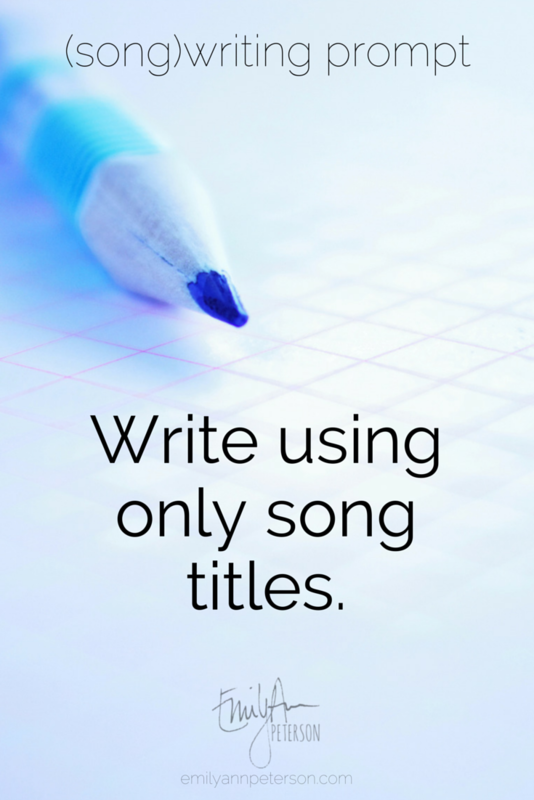 Write using only song titles. Further Prompt Challenge: This is a fun one! Queue up your iTunes library or Spotify playlists. Shuffle them and use as many song titles as you can to make a story, song, essay, poem. 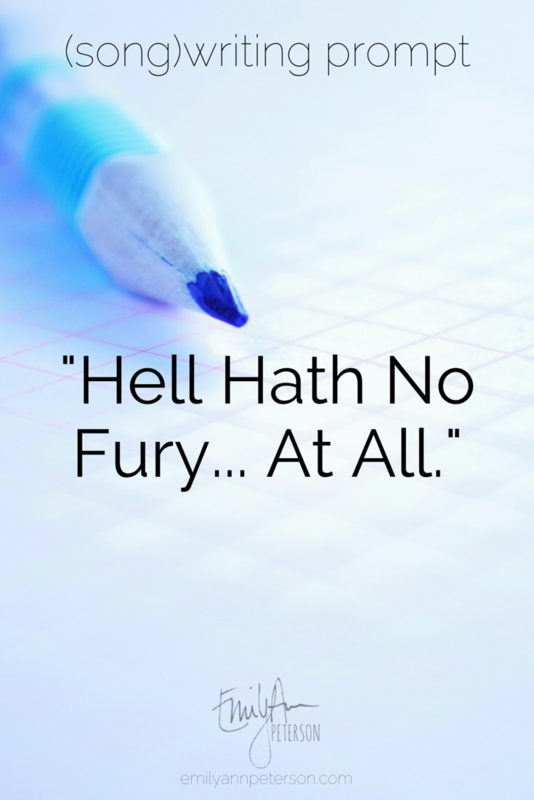 Prompt: Hell Hath No Fury... At All. I've decided to share my weekly writing prompts! Some weeks, you'll actually catch a glimpse at what comes from my own stab at the prompt. Hell hath no fury... at all.